Moles, nearly blind and weighing in at only 5 ounces, can do a surprising amount of damage to your lawn. In its unending quest for fat, juicy grubs and earthworms, a determined mole can dig surface tunnels at a rate of 18 feet per hour. That's 200 feet in a single, 24-hour period. Yikes. Fortunately, moles are quite territorial so although it may look like an army of moles has attacked your lawn, it’s unlikely that you have more than three per acre. Prepare your traps. Thoroughly wash the can and leave it outdoors for several days. Handle the can with gloves to prevent leaving a human scent on your trap. Locate active tunnels. Stamp down short sections of runways and mark these areas with a stick. Wait 24 hours and check the marked sites. If there are signs of excavation, the tunnel is active. Once you’ve located an active tunnel, begin a careful excavation. Do not disturb the tunnel more than necessary to set you can in place. Measure the height and width of your can. Dig a hole that corresponds to the width and height of the can. Measure the depth of the hole from the bottom of the tunnel; the lip of the can must be even with the floor of the tunnel. Drop the can into the hole vertically and pack dirt tightly around the sides of the can. It should be secure in the hole. Collapse about 1 foot of runway on either side of the can, packing the dirt up to the lip of the pit. Cover the hole with a board and leave the site unattended for 24 hours. Check your trap once or twice a day. 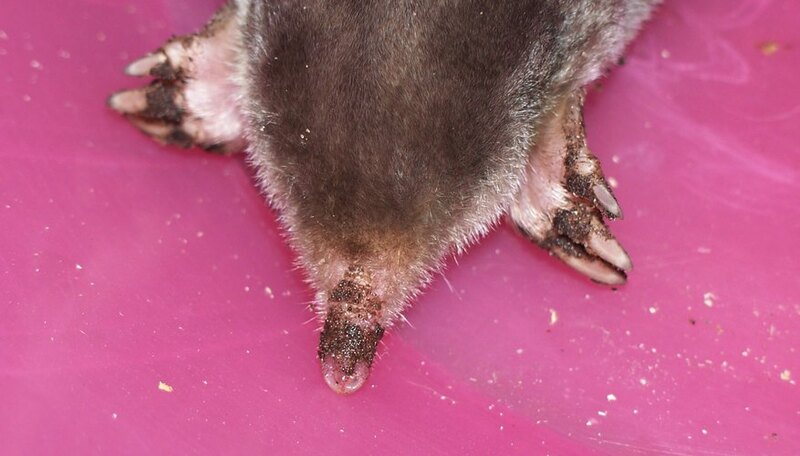 If you don’t capture a mole with 2 to 3 days, move your trap to a new location. Release captured moles on a remote section of your property. Moles are most active in surface tunnels during spring and fall, especially after a rain. During the summer and winter, they tend to spend more time deep underground. Wear gloves when handling a captured mole. Be aware that some states have regulations regarding the release of captured wild animals on property other than your own. Contact your local Fish and Wildlife Service office for information about your state's policies.